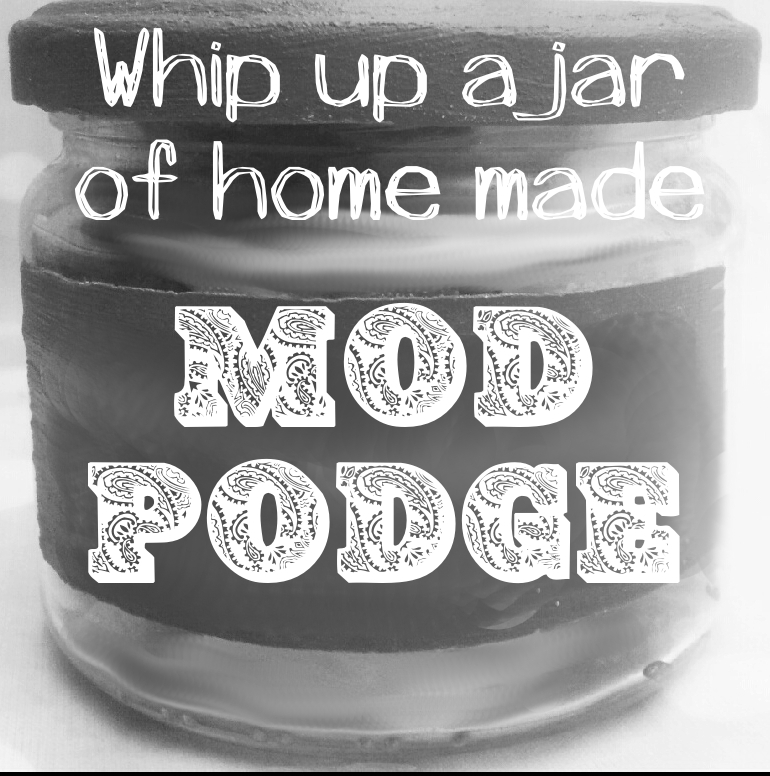 Home Made Mod Podge Recipe- Don’t be hoodwinked! In lots of ways I am a hand clapping optimist. I find it really hard to imagine the worst case scenario and always think everything is going to work out, which is often to my detriment. In other ways I am a doubting cynic. When it comes to brands and their promises I am more dubious then Scooby doo smoking doobies in dubiousville. When a grand claim is made of a product my mind screams “LIES, ALL DAMN LIES!” like some kind of crossed witch. That’s: PVA glue with water in it. But people are paying heaps for this crafting Must Have, to do things like decoupage and scrapbooking, that people have done for years with watered down PVA. To make a jar of fake Mod Podge you need 1 cup of glue and 1/3 cup of water. Shake really well and use as you would Mod Podge. To make it gloss add 2 table spoons of water based varnish or to make the sparkly add super fine glitter. I wanted to try making some decorated pegs. I made some Christmas pegs with ribbon and scrabble tiles in this way but found cutting the fabric and getting it to not fray really tricky. When I read on Sew Scrumptious’s lovely site that she used Mod Podge to make the fabric paper-like I gave it a crack with my fake Mod Podge. It really works. Linking up with Lakota’s Ta Dah Tuesday AND the wonderful monthly Pinaddicts challenge– although this was originally Sew Scrumptious’s pin! Come and find Lulastic on Facebook! Posted in Craftiness, Thrifty and tagged craft, decorative, fabric, fake mod podge, home made, homemade, material, mod podge, modge podge, pegs, pva, water. Bookmark the permalink. I do still have some mod podge, but indeed it is just PVA and water, and I have that too! 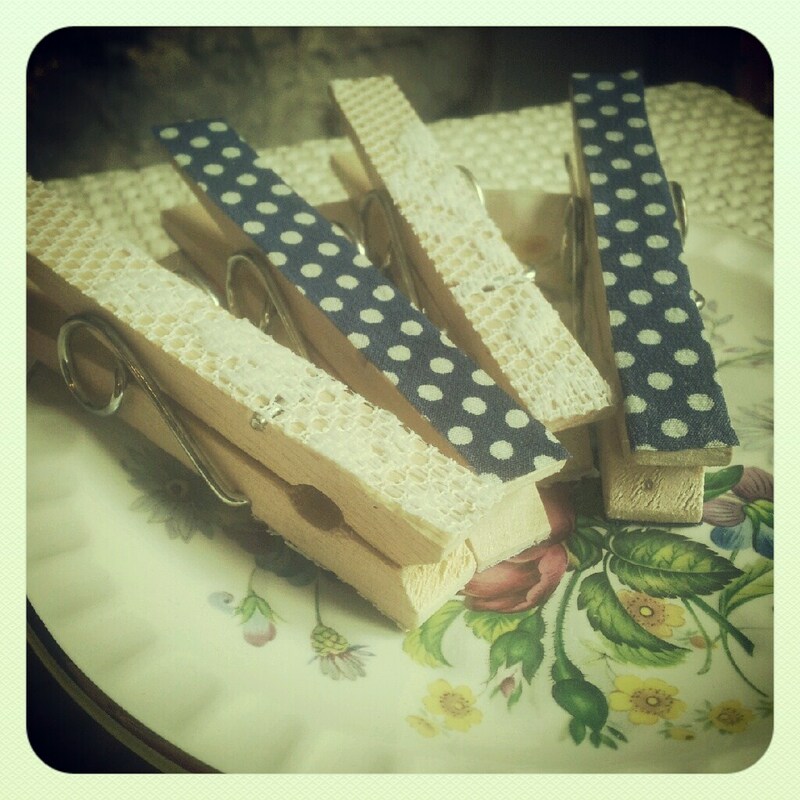 Cute pegs – my smallest is particularly in love with pretending to be washing. I have to put pegs on him and pretend I think he’s a sock or old pair of pants! Hehehehe that is SO adorable! Ramona loves helping me with the pegs, but mostly she just gets her tongue/lips pinched in them and cries. Have read about people using it on so many blogs, wondered what it was. Thank you for clearing that up. I shall not be going out of my way to get any. Home made it is for us! Yes, it seems to be going wild at the moment hey? Also, I just commented on your blog but WP seems to be dropping my comments at the mo? Maybe in spam? It was in spam, so I have moved it. Yeah, I don’t actually make up a whole jar, just little bits as I need it. Homemade wins every time for me, (i will even admit to being happy with Aldi mayo ) I would love to tell you i’m your newest follower, but i cannot find out how to follow you other than by e-mail. If you have time could you guide me in the right direction. Much obliged. Maybe the RSS feed on the right hand side, just below the Twitter bit? Also, Bloglovin? It is host neutral and I’m learning to love it. There was me thinking Modge Podge was some amazing stand alone product! Now I know if I ever need some what to do, so thanks for that! It is quite dear isn’t it. They are on to a winner I think! I just searched the other day for the ingredients of MP, after which I happily watered down my glue! Great fabric stiffener & all purpose magic thing! Oh Hurrrahhhh for your resin crafts! So glad you did it! I’ve just done my first decopage (which my husband insists is a word I’ve just made up) and I’ve used PVA, worked just fine. Lol. Do you say it in a a very French accent? You kind of have to eh. I do have a pot of it knocking about, but I bought it several years ago. I’m definitely a fan of using DIY versions of such things if they work. I am the worst- I ALWAYS think there is a DIY option. And google doesn’t tend to tell you otherwise haha. Somewhere out there there is a recipe for DIY gaffa tape! I was getting really grumpy that I couldn’t find anywhere to buy mod podge because so many American blogs use it for everything and I couldn’t find it over here. PVA and water, that I can do. Thanks for de-mystifying. Yay. Doh! Why am I only discovering what Mod Podge is now?! Bought it last month, ha ha! At least when it runs out I know to just replace it with PVA glue & water! I have some as my friend brought it back from the us for me, but since ready how to make my own on A Place of my own, I have been just watering down PVA. Hehe, thanks and thanks mad Aunt Sue! I’ll email you,m although don’t see myself as an expert! nice pegs! good tip on the PVA, I got some recently to try out decoupage but had read about Mod Podge and was wondering if I was missing out on some secret ingredient. Love. I guess will work for making kids fabric covered hairclips etc? On the ‘to do’ list! I have always been very suspicious of Modge Podge, mainly because I had only seen it on American blogs and thought that it might be something that has a different name in the UK. Turns out it does – PVA and water. Thanks very much, very useful! Haha we just made some papier mache-decoupage thingies today using…guess what…PVA and water! Cool cannae wait to see ’em! I am ready to devoupage something big and bad, like a whole table. I used to do heaps of decopage on anything and everything as a kid using none other than PVA glue! Was debating whether to get some mod podge to do a few projects, thinking it must have some miracle secret ingredient, but ill just stick with what I know now! Thanks heaps! Podge has a sealer in it….will this recipe hold up over time? Hello. I think for craft projects this stuff will be fine – it has been used for decades after all. Mod podge is only a sealer to a certain extent anyway- it isn’t waterproof so you need to use varnish over the top to really make any thing modpodged or pva and water last – i.e decoupaged furniture. Smells are such a giveaway! 😀 Look forward to hearing how you get on. Workshop sounds brilliant! I’m so glad I found this post! I have recently started blogging, as well as following your blog and just the other day I had searched for Mod Podge, figuring there might be a homemade version recipe out there. I have never used it before – the real thing or homemade – but saw this cute idea: http://www.infarrantlycreative.net/2011/04/cereal-box-crafts-notepads.html and just have to have some to make them as Christmas gifts for some kids I know! Do you think the homemade will hold up on something like that? Thanks for a wonderful blog – I love it here! AHHH thanks! Sorry for late response! I love those 🙂 and your own version. I would make it more glue than water, I d tend to tweak the rations depending on the materials I work with. Oh…just like others, I wish I had read this two days ago. I have been using Golden Acrylic Medium and ran out of it for a collage project. The closest store doesn’t carry Golden products so I looked online to see if Mod Podge was the same thing. Page after page of scrapbooking forums said it was the same thing. So I bought it. And the minute I opened it I could smell the PVA and new instantly that I had just wasted my time, my money, and and sadly, my project. Mod Podge is PVA glue. Elmer’s Glue-All. Aleene’s Tacky Glue. Same darned thing. I want my $5 back. And I agree with you about the Hellman’s. Nothing else comes close. I would love to hear your feedback , once you have been through a jar of it. I truly haven’t found anything where this stuff hasn’t sorted me out.